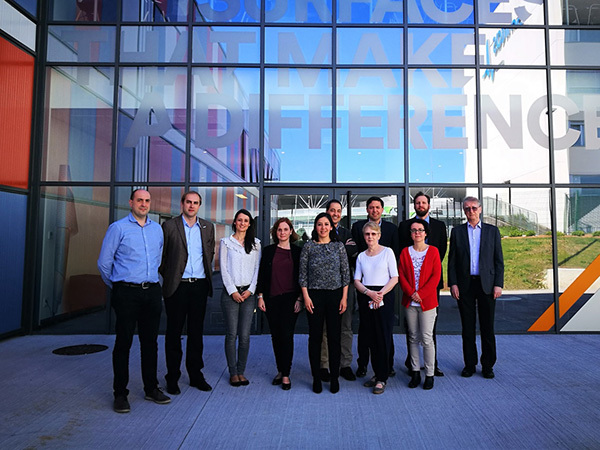 LIEBHERR-AEROSPACE Lindenberg GmbH visited CIDETEC Surface Engineering for the launching of the ECOLAND project, “Development of Eco-friendly protection procedures for LANDing gear aluminium alloys”. This project spearheaded by CIDETEC also relies on the participation of LVH Coatings (United Kingdom) and CTME (Miranda de Ebro). The project, financed by Clean Sky JU in the context of the Horizon 2020 programme, avails of a € 347,000 budget allocation for a duration of 18 months. LIEBHERR-AEROSPACE Lindenberg GmbH is currently a reference in the European aeronautic industry as a manufacturer of landing gear and flight control and actuator systems. In this project, the company seeks to develop an alternative treatment to chromic anodising based on anaphoresis that meets REACH standards. Anaphoresis consists of applying an organic coating by immersion using electric current. It has the advantage of enabling painting without the need for preliminary priming. This makes it doubly interesting since it facilitates the reduction of application time (reducing production time by about 55 %) while replacing with a single coat two layers that usually contain Cr(VI) (substances with this element will be prohibited starting in 2024 to meet European REACH regulations), such as those produced by chromic anodising and the primers currently in use. The treatment developed in the course of the project will be mainly applied to series 7000 aluminium alloys, very often used in aeronautical applications, which require mechanical resistance. Such an improvement is expected to lengthen the useful life of the components treated by 25 % in comparison with traditional anodised and painted systems, and to reduce manufacturing costs by at least 30 %. Moreover, thanks to the new coating system, parts of more complex geometries can be treated, making it possible to design lighter landing gear.